" Grandmother,tell us about the time when you were a little girl." 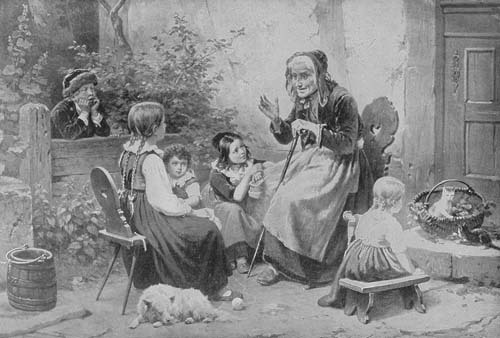 The children never tire of listening to the stories that Grandmother tells. This scene is happening in a German home, and Grandmother is remembering the time when the great Napoleon with his army came through the little German village where she was born. Her face comes alive as she relives those moments. The girls are so engrossed in what she is saying that their knitting is forgotten, and the ball of yarn rolls to the ground. Little sister, however, is more interested in the kittens than in listening to the story. The dog is taking a nap in the warm sunshine. We can tell that it is a sunny day because we can see the light shining on the girls' hair, and we see shadows under the bench and on Grandmother's chair. Notice the wooden bucket at the left side of the picture. The attached rope tells us that this is a bucket for drawing water from the well. We can see the corner of the well in the picture. Rain from the roof would go into the well and the water could be drawn out later for use by the family. The flowers behind Hans, the boy, are hollyhocks which were grown in many old-fashioned flower gardens. Look very closely and find the sixth child in the picture.